Ahead of the Mutua Madrid Open, the tournament held their first ever Charity Day with proceeds going to the Rafa Nadal and Iker Casillas foundations. 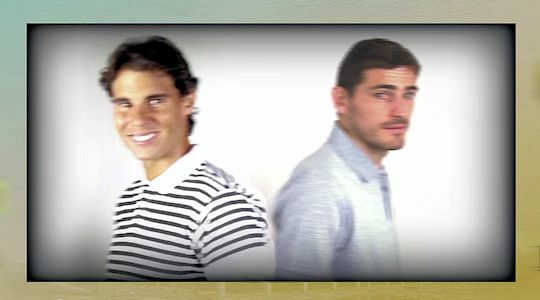 Apart from Rafa and Iker, participants included tennis players - Serena Williams, Aga Radwanska, Andy Murray, Feliciano Lopez and Carlos Moyá - and Spanish sportspeople and celebrities - Rudy Fernández (basketball player), Sergio Llul (basketball player), Thibaut Courtois (Atlético Madrid goalkeeper), Laura Sánchez López (model and actress), Cristina Pedroche (model and actress), Nieves Álvarez (model), Dani Rovira (actor) and Ana Fernández (actress). The games included a mixed doubles competition, a football tournament and dancing. Sadly, Rafa did not participate in the latter leaving us all still wondering what kind of moves he might be able to demonstrate. ...and they even let Rafa loose with a TV camera. It's hard to say who, out of the spectators and participants, enjoyed it more - but the important thing is that the event raised 23,500 euros for each foundation.